Amarilla was not going to have a great 1915. There was a lot of changes. With Grace’s death in 1911, there was nothing compelling R.S. McDonald, husband of daughter Grace, to stay in International Falls. He sold the house and left taking the children with him to Canada in 1915. Ronald’s story is better featured on the blog: The Man Who Lived Airplanes, see right of this blog for the link. In addition at the end of 1915, the Barclay Hotel and the store burned down and Amarilla took a big financial hit. Backing up a little, at the beginning of 1915, Amarilla lost her father. 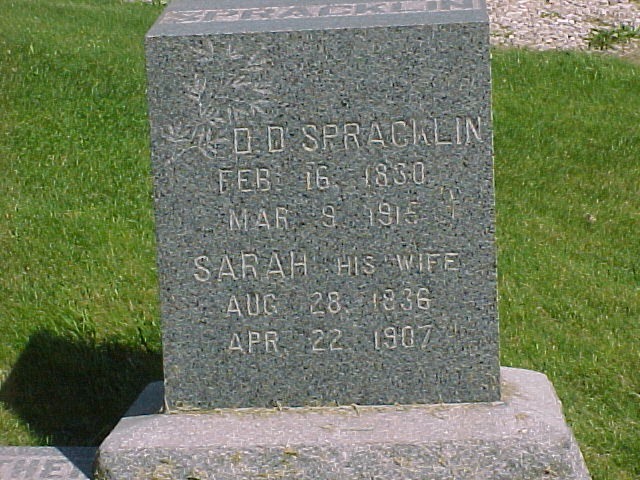 Daniel D. Spracklin or D.D. On 9 March, 1915 Amarilla’s father Daniel D. Spracklin died. I do not know how this affected her, she had left Iowa after 1875. I have never found any articles suggesting that she visited them in Iowa. Daniel was a quiet and simple man and it has been difficult to learn about him. He usually referred to himself as D.D. I have yet to find anywhere where he wrote out his full name including his middle name. There is a bit of controversy in the family about his middle name and its spelling. There are those that spell it “Dair” but I have reason to believe it is “Dare” which is the family name of his great-grandmother Mary Dare who was the mother of Elizabeth Andrews Spracklin, Daniel’s grandmother. Source: The Deep River Journal 3-19-1915 pg. 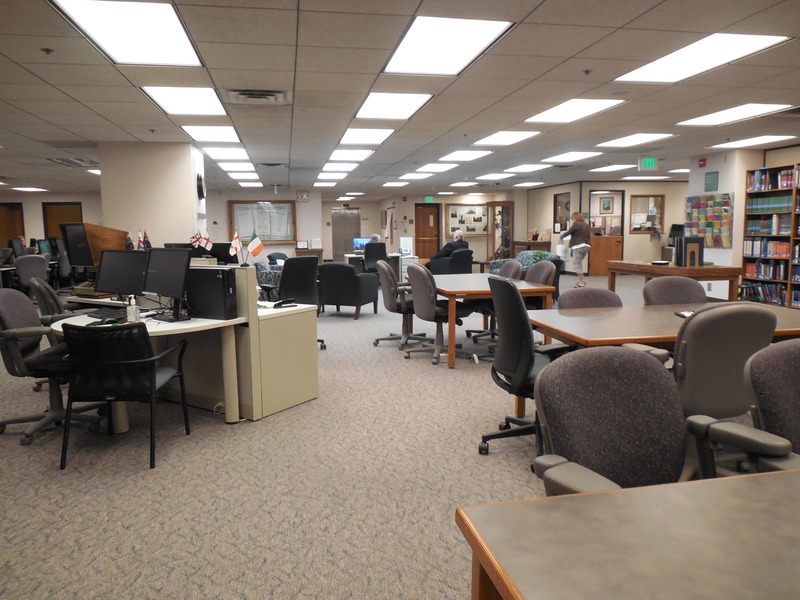 3, Iowa State Archives, Des Moines. Daniel’s Death certificate still doesn’t give his middle name clearly and is also a problem in that the names of his parents are unclear. The informant was Reed Spracklin, a son, and I think he was confused when he filled the death certificate out putting his own parentage in the spaces rather than his father’s. We know his father to be John Andrews Spracklin, who was born in England, and Lydia Goss, who was born in Ohio, from documents shared on the blog: Solomon Goss of Fearing Twp., in Ohio – see right side panel. Certificate of Vital Records – State of Iowa, Dayton Twp., for Daniel Dair Spracklin, male, white, born Feb. 16, 1830, age 85 yrs. 21 days, widowed, birthplace Ohio, father’s name is Daniel Spracklin, born in England, mother is Gauge, birthplace Penn, occupation farmer. Signed by R.A. Spracklin, of Deep River. Date of death Mar 9, 1916, died at 9 am of lobar pneumonia, senility. R. E. Guner of Deep River, UB Cemetery, March 13, 1915, by Connell of Deep River – funeral director. 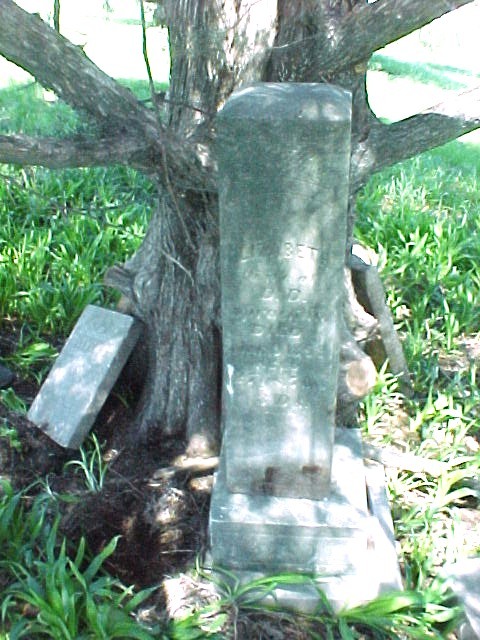 Daniel’s tombstone which he shares with his second wife Sarah is in the Community Cemetery near Millersburg, Iowa and is featured on Find A Grave. See BJM Cemetery Discoveries blog for more information. Daniel did not leave a will but he did have land so there was a probate of his estate. Reed Andrews Spracklin was the Administrator of the estate. From the sources above we see that Amarilla was unable to attend the funeral of her father because of ill health. It is unclear or unknown as to how close she was to the family and if she kept in touch. Charles Edward who is probably the Edmund mentioned above is her brother from the second family. He had migrated to Cass County by 1912 and maybe have been a contact for Amarilla. The above photograph of Amarilla was among her grandson possessions. It is dated 1911 but I think it gives us an idea of what she looked like at that time. 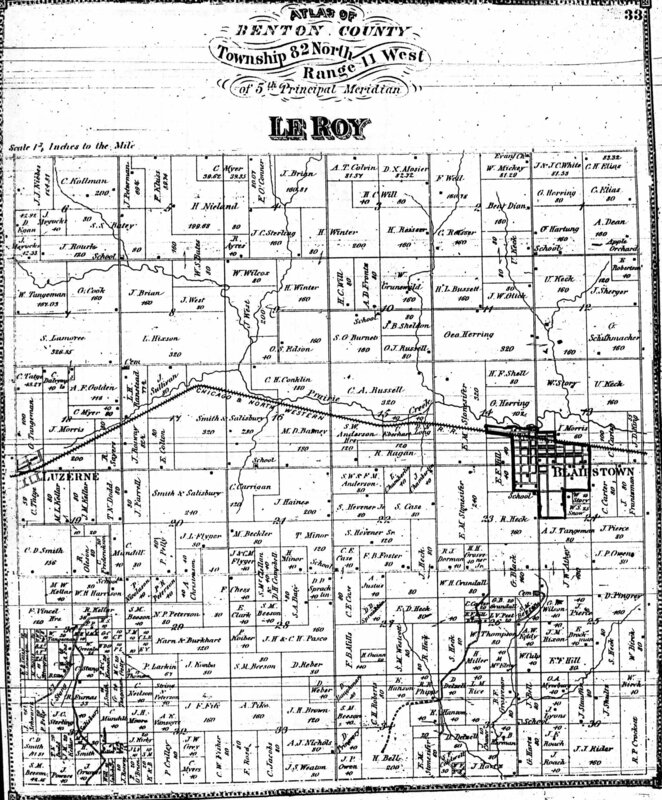 Amarilla is living in Pine River, Minnesota in 1910. She is alone and divorced. She states her father was born in England but that is not true, her grandfather John A. Spracklin was born in Somserset, England. Daniel, Amarilla’s father, was born in Ohio, although I don’t have confirmation of that with a bible record. 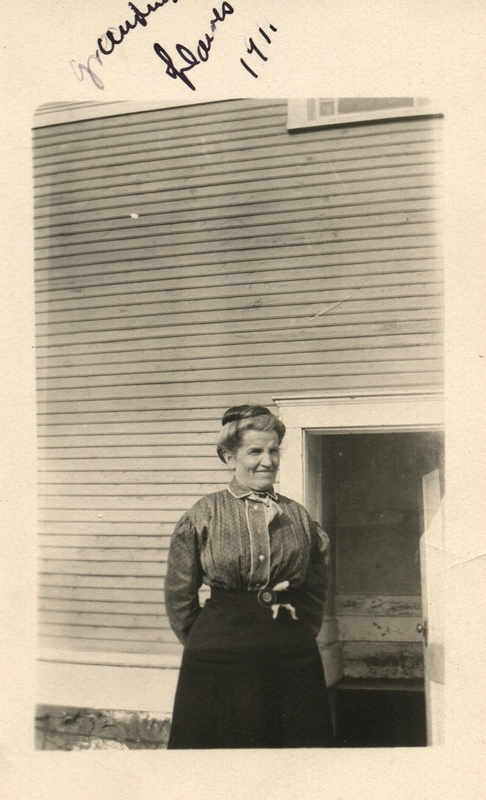 Street 33?, Visitation# 113, Family #115, Dawes, Ammarilla, Head, female, white, age 51, divorced, born in Iowa, father born in England, mother born in Ohio, trade/profession is milliner, millinery store, self-employed, able to read and write, owns her home, mortgage free, owns a house. Source: 1910 U.S. Federal Census, Pine River Village, Cass Co., Minnesota, SD 6, ED 23, Sheet 6A, 3085, T624, Roll 693. Pine River was now a city with names like Hauge, Grover, Gillespie, Holmquist, Benjamen, Hill, Fosburgh, Holman, Rohr, Huffman, McCallister, Kline, Crossman, Stanley, Larson, Robideau, Shaub, Glover, Lincoln, Kinler, Smith, Feakes, Russ, Sherwood, Hemness, Westfall, Edwards, Ruscor, Stingley, Johnson, Thorpe, Oliver, Jones, Kline, Sleepas, Socks, Strawsell, Eastvold, Townsend, Rice, Ames, Batchelder, Anderson, Blackburn, Stutson, Casper, Lancaster, James, Thornton, Francis, Leef, Heninger, Emery, Bowman, Coleman, Harmon, Vaughan, Westcott, Horkey, Waughan, Porter, Brown, Matteney, Olson, Finsaas, Berge, Mitchell, Greenwalt, Peabody, Graham, Parker, Weaver, Jones, Shuman, Marcott, Peabody, Behler, Wideman, Perigrine, Geary, Allen, Hill, Hussick, Ellwood, LaDu, Kulla, Cromett, Conrad, Nash, Westgren, Soper, Gilbert, Fox, Green, Luidberg, Jackson, Shill, Thompson, Pike, Brower, Ager, Lonis, Barker, Saxton, Wood, Peters, Henry, Jewel, Carver, Halvorsen, Forbes, Zigmund, Moulster, Spencer, Hardy, Loomis, Sandall, Rounds, Eidam, Dawes, Boode, Linden, Curtis, Senechal, Woesner, Dahl, Southwick, Bell, Williams, Waggner, Wagoner, Staples, Husel, Krukow, Linden, Henry, Becker, Erickson, Davis, Ritche, Ingraham, Silk, Andrews, Miller, Wehrman, Levoy, Andrews, Snell, Chyrklund, Lillstrom, Hanson, Haugen, Clarke, Lalone, Arnold, Hall, Kierstine, Ralya, Austin, Bickford, Rovik, Christen, Patterson, Brewer, Stewart, Moberg, Mattson, Bark, Webber, Parson, Kennedy, Rice, Modok, Kenney, Rugg, Petti, Fritzner, Peterson, Loper, Butler, Ritzler, Lindell, and Palmo. Many were families with the same last name, I only listed once, I hope, and many were lodger’s which means they may be on the move. This is not a complete listing of the population for Pine River. I do recognize names other than Dawes. Pine River has grown up. Well, I am back from my travels. My second trip to Canada is completed and that happened in September 2014. Remind me not to travel in the Fall because you have to drive through thick fog, rain, cold and wind storms, brrrr…. Fortunately, I did not have to deal with snow. It was a great trip and I posted about it in The Man Who Lived Airplanes and the Boardman and Brown blog – see side panel for links. I did 1964 miles just 49 short of my first trip. It was EPIC! 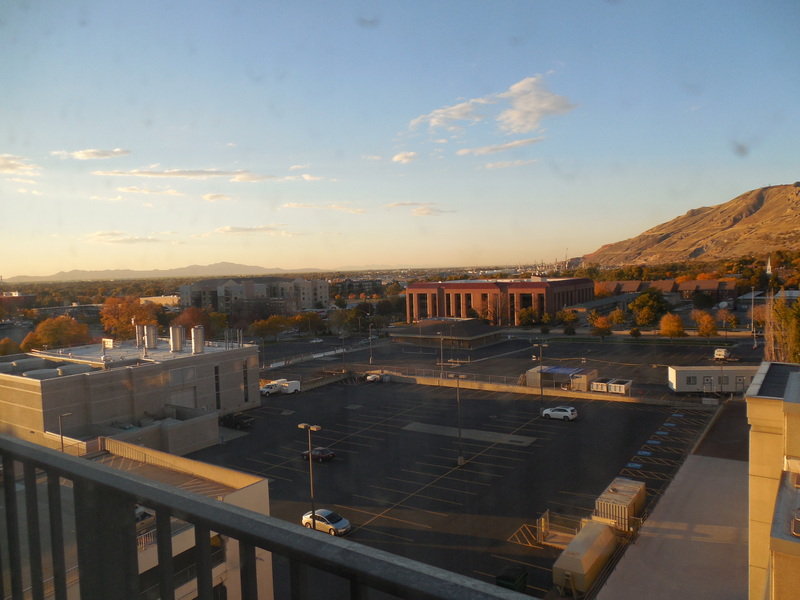 While in Salt Lake City I was at the Family History Library doing research I did try to seek out John Barclay and his first wife Margaret but was not successful in finding him listed in the indexes that they had, so it will probably require some more digging, fortunately, I have a road map with my class lessons. Class on Irish Research which I probably should take next? Let’s see, I left off with Amarilla and J.G. Dawes in the 1905 Census in Pine River. I will continue to follow Amarilla through the rest of her life touching on the people who were part of her experience which includes her half-siblings from the 2nd marriage of her father Daniel D. Spracklin: Lydia, Virda, Reed, Daniel, Peter, and Charles Edward. They are all characters just like Amarilla. Yes, I will discuss her marriage to J.G. Dawes and later to George Urton. Her “of the blood” siblings have been written about: Henry, Oliver, Mary and from the second marriage Alfred. I will share some about Henry’s descendants especially Harry his first born. There will be posts about the end of Daniel and Sarah’s lives and why it is so difficult to find them in the records in Iowa, it is because they left. I had to go there to Iowa to find them. There will be more about Amarilla’s grandchildren and daughter Grace. How all these events and happenings affected Amarilla is difficult to say. I really have very little personal information about her or memorabilia from her like a diary or letters. Sigh! On George’s side, I have some more interesting tidbits and will write about my research on his siblings and half-siblings. According to his brother Alexander’s probate file there were 11 children that were involved in the process, one of which was represented by his children. Yes, it is a mystery. So brother Alexander Barclay end of life will be a big topic. There are two other blogs you should be consulting and that is the Solomon Goss of Fearing Twp. in Ohio where I share about Amarilla’s grandparents on both sides of her lineage. Elizabeth Keller Spracklin’s parents, John and Mary Keller, are discussed and this line leads to DAR and Mayflower. On Daniel’s side I write about John and Lydia Spracklin and their lives in Ohio and will go back further into that lineage. Lydia Goss Spracklin line also leads to DAR and Mayflower. If you are interested in Amarilla’s daughter Grace’s life you could read about it in this blog and also in The Man Who Lived Airplanes. That blog is about her son Keith’s life and the family. Grace married Ronald S. McDonald in 1898 and had 8 children one of which was Keith, my father. I will touch upon his siblings briefly in this blog, but for more details go to the Man Who Lived Airplanes. My dad loved airplanes and worked around them all his life. 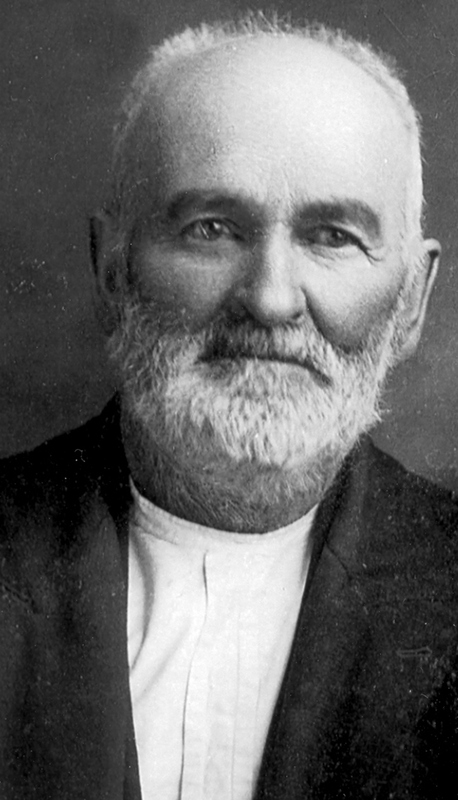 Amarilla’s father Daniel D. Spracklin migrated to Iowa about 1855 from Ohio and settled first in Benton County and later moved to Iowa County, Iowa. Daniel’s first wife, Elizabeth Keller, traveled with him and their babies to Iowa where she died and is buried in the Titler Cemetery. I have posted about Daniel and Elizabeth in past posts. The marriage of Daniel and Elizabeth is recorded in the Morrow County, Ohio records in 1853. He lived in Knox County with his parents John Andrews Spracklin and Lydia Goss Spracklin till he migrated to Iowa. I will be taking a break from this blog so I can devote my time and energy to my pending trip. I will return in the Fall! Stepping Back In Time: Amarilla’s Life In Iowa Before George! In recent published posts I have talked about John Keller and Mary Anne Delano Keller who were Amarilla’s grandparents on her mother’s side. Amarilla was the daughter of Daniel D. Spracklin and Elizabeth Keller. Daniel’s parents were John Andrews Spracklin and Lydia Goss. Daniel and Elizabeth had 4 children. By 1860 Elizabeth had passed. She had died in 1859 just months after Amarilla’s birth. 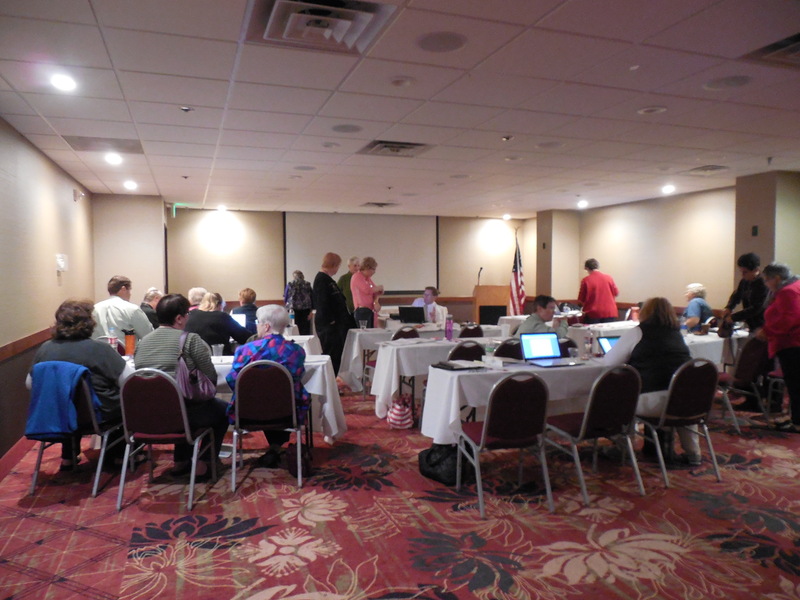 A thorough page by page search of the Iowa census was attempted but Daniel was not found. Amarilla does appear in the 1860 Iowa census in Benton County, Iowa but she is not with her father Daniel? She is with her sister Mary and another family. It is my belief that this is Mary and Amarilla even though the spelling is different. The ages are correct and the location is close. As for the Shelley family, I do not know what their relationship to Daniel maybe. The Spracklins and the Kellers are large families and this could easily be relatives that I do not have knowledge of. They could also just be neighbors and friends helping out. The other interesting fact is that Henry, the older brother is also displaced and living with another family in 1860. In this case it is his Aunt Olive a sister of Daniel’s. W. P. Merifield Family, 1860 U.S. Federal Census Leroy Twp., Benton County, Iowa, Reel No M653, # 311, Page 162. Merifield, W.P. 29 farmer 800, 300, born in Ohio, Olive 27 yrs. born in Ohio, Lydia 7 yrs. born in Iowa, Corista 2 yrs born in Iowa, Spracklin, Henry 7, born in Ohio. There is no sign of Amarilla’s father. I did a house by house search of the township and there were lots of houses that were empty. I even searched in Ohio to see if Daniel had gone back to his home in Knox County, Ohio because his father John Andrews Spracklin had died in 1862. I cannot find him. So the death of Elizabeth Keller Spracklin in 1859 really created a temporary scattering of the family of Daniel D. Spracklin at that time. There does not appear to be any evidence that he joined the fight and enlisted in the Civil War. By 1870 Daniel is back in the census and he is remarried to Sarah. He has Henry and Amarilla with him from his first marriage. Emily is Sarah’s daughter from her first marriage. Sister Mary died on the 27th of September 1861. This death must have affected Amarilla even though she was very young. By 1870, Sarah and Daniel have started to have a family of their own. The other children: Lydia, Birdie H (Virda), Reed A. are of the 2nd family. Daniel D. Spracklin Household, 1870 U.S. Federal Census LeRoy Twp., Benton Co., Iowa, June 17, 1870, Post Office is Blairstown, Page 18. Line 34, 123, 122, Spracklin, Daniel, age 40, male, white, famer, $3300, $700, born in Ohio, father and mother of foreign birth, citizen of US. Sarah, 34 yrs., female, white, keeping house, born in Indiana. Henry F. 17 yrs., male, white, born in Ohio. Emily, 13 yrs, female, white, born in Indiana. Ammarilla, 11 yrs., female, white, born in Iowa. Lydia M., 5 yrs., female, white, born in Iowa. Birdie H., 4 yrs., male, white, born in Iowa. Continued page 19: Reed A., 1 yrs., male, white, born in Iowa. Henry, Emily, Ammarilla, Lydia attended school within the year. There are other names listed under the notation for Daniel in 1870. Nelson, Peter 26, farmer with 600 value of personal estate from Denmark, Nelson, Hardie 26 keeping house, from Denmark, Nelson, Andrew 1 yr. born in Iowa, Nelson, Peter 5/12 yr. born in Iowa, all have parentage that are foreign birth, Frederickson, Ann 8, from Denmark, Anderson, Peter 23, laborer Denmark, both with parentage foreign. Daniel remarried on 21 November 1863 to Sarah Blacketer Allgood in Marengo, Iowa Co., Iowa. He is still living in LeRoy Twp. in Benton County, Iowa but that will change. Amarilla was 5 years old when he marries Sarah. She may be young but old enough to know that something has happened. In the closeup of the Benton Co. Atlas Daniel’s land is in two parts of 40 acres each. There is a double line almost in the middle and Daniel’s land is on the left of the line under the School. There is a dot showing this piece of land. The other land is to the right on the other side of the double line with another dot next to a Case and below A. Justus. Which piece of land Daniel had his house located on is not known. This is why Amarilla’s great-granddaughter, the writer of this blog, believes she was born nearer to Blairstown. Daniel did not move to Iowa County, Iowa 20 miles south till after 1872. Amarilla was born in November of 1858. 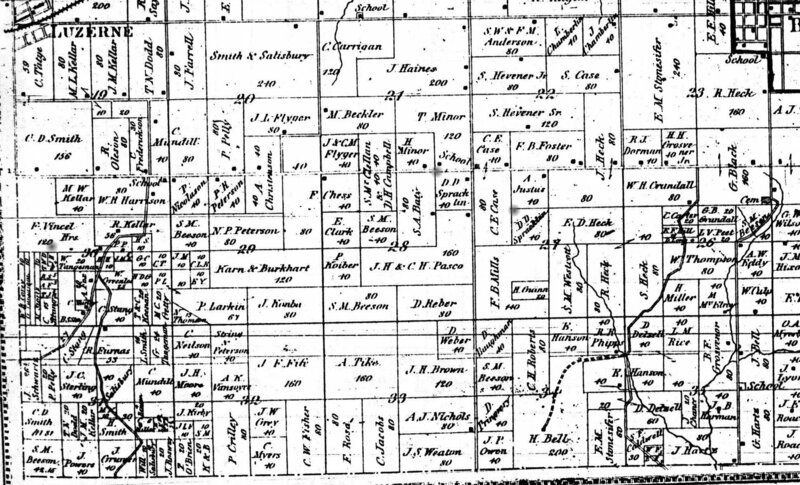 If you go back to the 1856 Iowa State Census you will find interesting things going on. 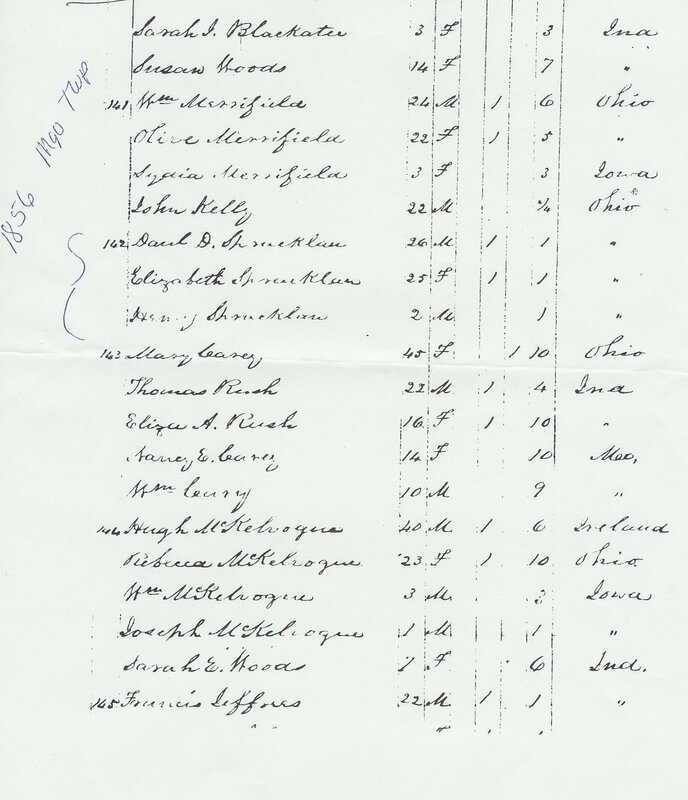 Daniel is not mentioned in published indexes for this census but he is definitely there and he and Elizabeth and their son Henry are living next to Blacketers, and Daniel’s sister Olive Merrifield and her family. So Amarilla’s beginnings are a bit precarious. She looses her mother at a very early age, a sister dies and she is separated from her brother and father for maybe a year or two? Then her father returns to marry a stranger. This is a lot for a 5-year-old to take in.